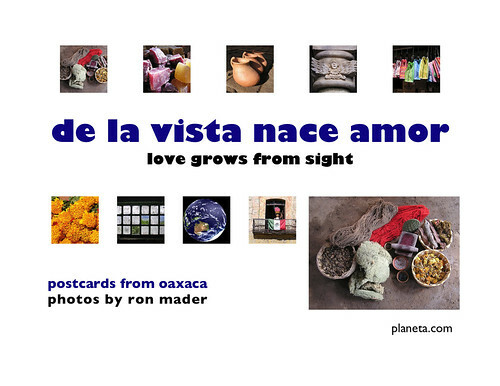 To raise awareness of the extensive cultural and biological diversity in Oaxaca, Mexico, postcards with images taken by Ron Mader are being designed with Oaxaca City-based graphics design company Despacharte. “Postcards are a terrific souvenir of a trip and a reminder of people and places worth remembering,” said Ron Mader, a journalist based in Oaxaca City. Each postcard includes a bilingual description and a classic Mexican proverb. The postcards are on sale at bookstores, hotels and cafes. Consult the Oaxaca Wikispace to find out where to find the postcards. In an age of email and twitter, postcards are an example of slow travel. “By using images that are less common and by including comments from locals, we highlight the value of Oaxaca’s unique cultural and biological diversity,” Mader said, adding that when purchased in Oaxaca any postcard can be sent to friends and family at a leisurely pace.